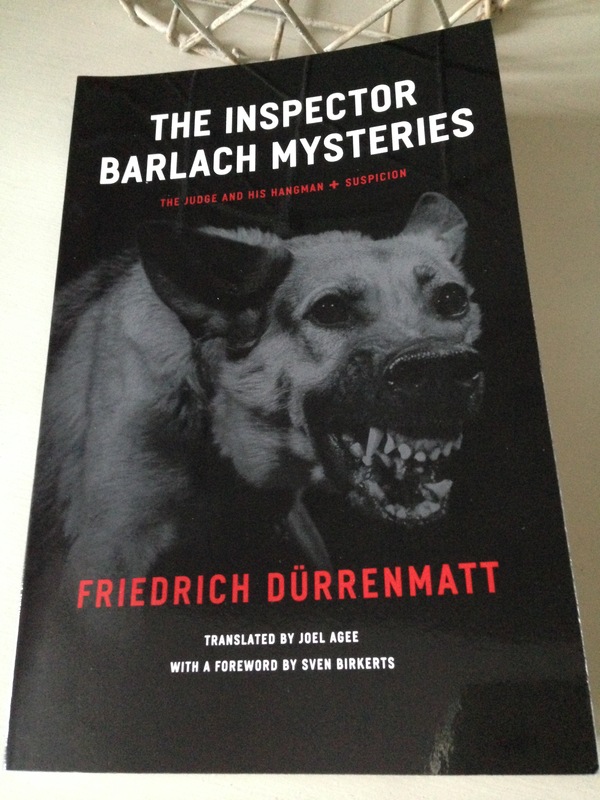 Last November, off the back of this excellent review by Grant at 1streading, I bought a copy of The Inspector Barlach Mysteries by the Swiss author and playwright Friedrich Dürrenmatt. My University of Chicago Press edition contains two novellas: The Judge and his Hangman (1950) and its sequel, Suspicion (1951), both of which feature Inspector Barlach of the Bern police. It proved to be a great choice for Caroline and Lizzy’s German Literature Month, an event which is running throughout November. These stories offer so much more than the intrigue of traditional mysteries – they raise complex moral and philosophical questions to which there are no easy answers. As a consequence, the pair ended up making a bet: Gastmann declared that he would commit a crime in Barlach’s presence without the young police specialist being able to prove that he did it. Three days later, Gastmann carried out his promise – Barlach had him arrested but was unable to prove his opponent’s guilt. And so the crimes continued with Gastmann remaining one step ahead of his pursuer on each occasion, the violations becoming bolder and more daring over time. This is a very clever mystery, strong on mood and atmosphere with scenes of palpable tension, particularly in the closing stages. Without wishing to reveal too much about the plot, the novella’s denouement will prompt the reader to reflect on the moral issues at play. When it comes to crime and punishment, can the end ever justify the means? Despite his retirement from the Bern police force, Barlach is itching for one more adventure. As he recovers in hospital, he begins to investigate Nehle and Emmenberger, relying on the help of a variety of contacts in the process. When Barlach discovers a report stating that Nehle took his own life in Hamburg in 1945, Hungertobel is convinced this puts an end to any doubts. Barlach, on the other hand, keeps digging. There remains the possibility that Emmenberger and Nehle exchanged identities at some point. If this were true, the concentration camp doctor might still be alive, posing as Emmenberger and running an exclusive treatment facility near Zürich. Consequently, Barlach persuades Hungertobel to have him transferred to Emmenberger’s clinic where he hopes to uncover the truth. Once again, this story touches on a range of existential issues, in particular, the nature of hope, faith and justice. There is a clear parallel between the cancer from which Barlach is suffering and his desire to fight evil, a force with the power to destroy humanity if it remains unchecked. Dürrenmatt has been compared to Simenon, and I can see why. These are excellent, thought-provoking stories, beautifully written, too. I’ll finish with a short passage on the Jura countryside, which I hope will give you a feel for the author’s style. It’s clear-cut and wonderfully atmospheric — perfect for a cold, dark winter’s night. MarinaSofia has reviewed the first novella for Crime Fiction Lover. Her review of Suspicion is here. The Inspector Barlach Mysteries are published by The University of Chicago Press. Source: personal copy. Book 15/20, #TBR20 round 2. This entry was posted in Book Reviews, Dürrenmatt Friedrich and tagged #GermanLitMonth, #NovellaNov, #TBR20, #TranslationThurs, Book Review, Fiction, Friedrich Dürrenmatt, Germany, Joel Agee, Literature in Translation, Novella, The University of Chicago Press on November 4, 2015 by JacquiWine.